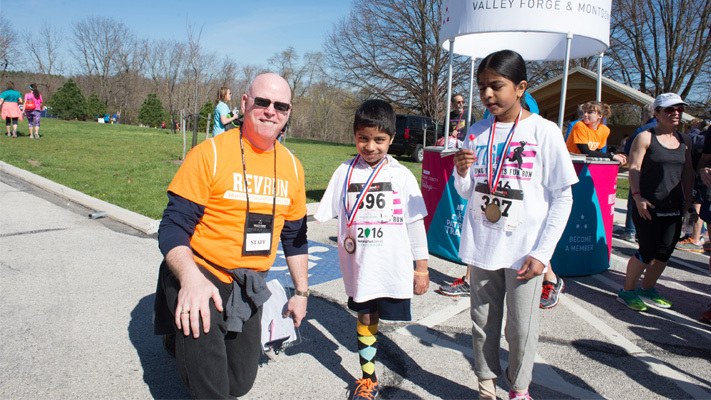 As VFTCB Communications Manager, one of my roles at the annual Valley Forge Revolutionary 5-Mile Run® is to keep alert for possible stories, either to present to the press or capture for our own purposes. The 2016 Rev Run was my third experience with the event. And I stumbled on what may be the most memorable story ever. I was at the start line, assisting with the pre-race program. The 1,300 runners then lined up and after the starting gun, departed. After them, some 250 walkers also set off on their three-mile course. 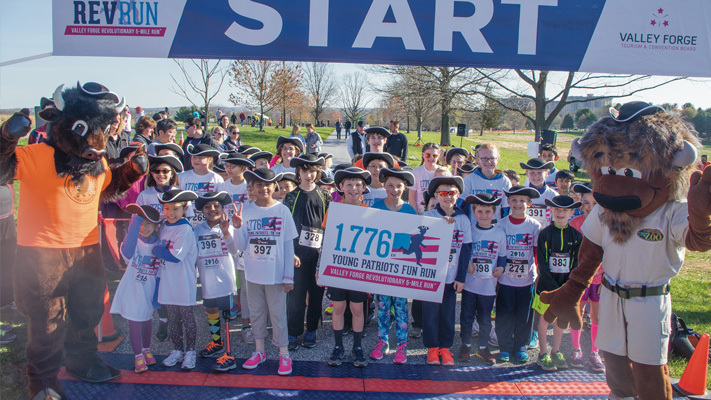 All that was left were the children ready to tackle the one-mile Young Patriots Fun Run. And I noticed little Hari Tadpatri, a seven-year-old from King of Prussia. He was standing next to his dad, squinting into the blazing sun from under the brim of his ball cap. The kids lined up, and Hari took his spot. With nearly 75 young registrants, the starting line was full of energy, with plenty of kid-fueled enthusiasm for running on such a beautiful morning. Two bison mascots were pumping up the runners; one, Buddy, is the mascot of the National Park Service, which was onsite to celebrate the centennial of its founding. The other is a local-celeb, Bubby the Bison from Norristown&apos;s Elmwood Park Zoo. A giant crayfish was also on hand, highlighting the park&apos;s initiative to rid its local waterways of the harmful creature. Amid the nervousness, however, Hari stood with his sister, Hamsag, 10, holding her hand. VFTCB race organizers handed out signs to the parents standing nearby, and the Tadpatris&apos; father took one: You Are Awesome, it proclaimed. The gun sounded, and a troop of kids (plus two bison and a giant crayfish) thundered past Hari. He was jostled from behind but kept his footing. The pack out-paced him. He set forth, clearly determined to cover the 1.776 km distance. With his dad patiently walking along, Hari&apos;s last-place position had no effect on his happy grin. His demeanor had him first by a length. The kids reached the turnaround point and flew back to the finish line, again blurring by Hari going the opposite way. Before long, Hari and his dad were was the only ones left on the course. Graham Dellinger, historical interpreter for Valley Forge National Historical Park, noticed the sole athlete still on the course. He took up his stride right beside Hari. Dressed in full Continental uniform, including tricorne hat, Dellinger dutifully paced with the Tadpatri. At the finish line, a welcome party hastily prepared for the final competitor. Deciding to give him the hero&apos;s welcome he deserved, the two bison mascots and a colonial reenactor stretched a crepe paper ribbon across the line. Hari broke through it like a champ. And was loudly cheered for his effort. In a post-race interview, the first-grader commented on the day. "I liked running with the lobster," he beamed. There were other stories that unfolded in this 11th annual event: Victories. Placements. Medals. Team bonding. Celebrations. But perhaps none channeled the spirit of Valley Forge - the struggle, grit and determination that helped win our liberty - than the saga of a determined seven-year-old.